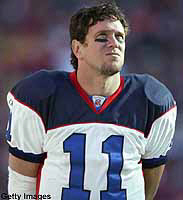 Drew Bledsoe has joined the Cowboys! With a tenure of 12 years in the NFL, and having played the first 4 of his career for Parcells, Bledsoe is reunited with his former coach. Is this bad news for Vinny Testaverde? Mostly so. How big and how important will this move be for the boys? Well, I truly do not know. I’d heard that owner Jerry Jones was not in the mood to agreeing into this, and it looks like Parcells has yet won another battle. All I really care is to know how effective this team will be in the near future. There are lots of rumors about Parcells being done with Dallas already and that the team is going definitely downhill.